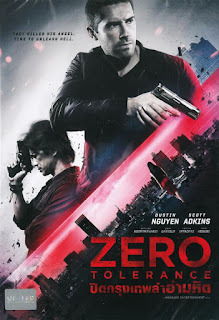 I saw the action thriller Zero Tolerance more than a year ago as part of the very unique Thailand International Film Destination Festival. It was a treat to see, because it was accompanied by a question-and-answer session with director Wych Kaosayananda, star Dustin Nguyen, plus actors Sahajak "Pu" Boonthanakit and Kane Kosugi. The film, which went on to home-video releases in the U.K. and other territories, has finally come out on DVD in Thailand. In celebration of that, I want to link to an article I did for The Nation back in February 2015. It was written out of devotion to Dustin, Thai action cinema, the Thailand Film Office's very strange festival, and as a mea culpa to Wych Kaos, who I had so heartlessly trashed in my early blogging days, back when he was trying to make it in Hollywood with the roundly assailed Ballistic: Ecks vs Sever, a film I think everyone would rather forget. I reckon it was the outspoken Wych's participation in the documentary The Stunt that altered my view on his place in the biz. "What happened with Ballistic really pretty much broke me," Wych told the audience. "I didn't want to make films for a while. I turned to music videos and commercials. I worked on other people's films. "Now I'm over all that. When I started my first professional job, I was 23. Now I'm in my 40s. So, perspective," he said. "I've done three movies that I consider my own – Fah, Ballistic and Zero Tolerance. And ironically, the world has only seen one my movies that is my version, and that's Fah. "If I'd seen [Zero Tolerance] 10 years ago, it would have upset me. But sitting back there just now, I enjoyed it." Viewers who have only seen Ballistic might also enjoy Zero Tolerance, with its relative coherence and zippiness being an eye-opener – a more-accurate representation of what the passionate and savvy Kaos is capable of accomplishing. The rest of the piece is still available on The Nation website. The DVD, meanwhile, has English and Thai soundtracks and subtitles and is available in Thai shops, including retailers like Boomerang and Cap records. The story has Dustin in the lead as a former paramilitary operative who comes to Bangkok seeking answers about the death of his daughter Angel. He’s assisted by a former covert-ops colleague, Royal Thai Police officer Peter (Sahajak Boonthanakit). They tangle with various bad guys, including a drug-dealing Westerner (Scott Adkins) and (at least in the version I saw) the owner of a sleazy bar (Gary Daniels). Kane Kosugi also gets his kicks in. As for the Thailand International Film Destination Festival, which is all about foreign-film productions made in Thailand, word around town is that it might happen again. However, details remain sketchy and probably won't be fully known until right before the festival is set to actually take place.